Autograph Letter Signed and Typewritten Letter Signed, each one page, small oblong quarto and quarto, January 1 and January 22, 1934. To Walter J. Cummings, Chairman of the Federal Deposit Insurance Corporation. 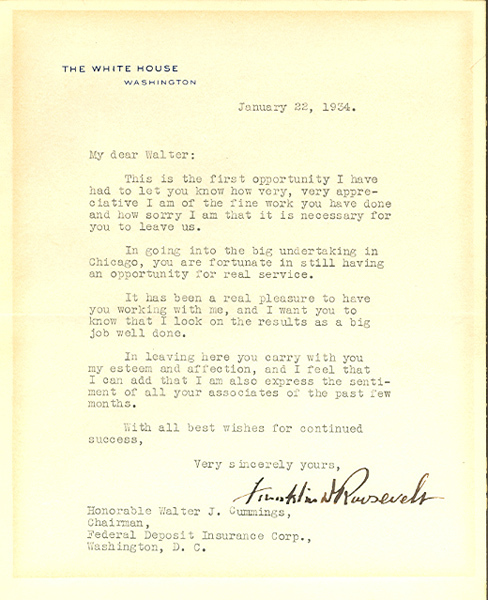 On New Year’s Day Franklin D Roosevelt writes: “I congratulate you and Mr. Bennett and Mr. O’Connor because you have in these few months accomplished with complete success a gigantic task which the pessimists said could not possibly be done before January 1. That 97% of the bank depositors of the nation are insured will give renewed faith. I am also happy to know of the fine co-operation given to you by the Reconstruction Finance Corporation. 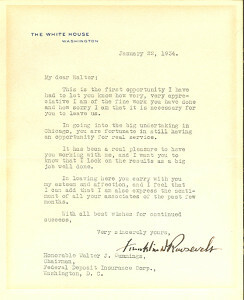 Three weeks later Franklin D Roosevelt writes in response to news of Cummings’ resignation: “This is the first opportunity I have had to let you know how very, very appreciative I am of the fine work you have done and how sorry I am that it is necessary for you to leave us. In going into the big undertaking in Chicago you are fortunate in still having an opportunity for real service. It has been a real pleasure to have you working with me, and I want you to know that I look on the results as a big job well done. In leaving here you carry with you my esteem and affection, and I feel that I can add that I am also express[ing] the sentiment of all your associates of the past few months. With all best wishes for continued success. Franklin D Roosevelt writes ten months after becoming president. When he took office, he was confronted with the worst economic depression in the nation’s history-most of the banks were closed, industrial production was down to 56 percent of the 1929 level, 13 million or more persons were unemployed, and farmers were in desperate straits. Through a broad array of measures, Roosevelt launched the New Deal, seeking quick recovery and then reform of the malfunctions in the economic system that he thought had caused the collapse. First Roosevelt ended depositors’ runs on banks by closing all banks until Congress could pass a cautious measure allowing those in a sound condition to reopen. This act alone restored a measure of public confidence and helped check further bank runs. The administration followed with banking acts of 1933 and 1934, barring banks from dealing in stocks and bonds and establishing the Federal Reserve Deposit Insurance Corporation. By executive orders in April 1933 Roosevelt called in all gold, forbade its export, and formally took U.S. currency off the gold standard. In the fall of 1933 he experimented with “managed currency,” driving down the gold content of the dollar and tripling the price of silver through large purchases. These efforts brought only small price increases at home, but they improved the position of the United States in foreign trade by making dollars cheaper abroad. In January 1934 Roosevelt stabilized the gold content of the dollar at 59.06 percent of its earlier value. He also introduced a program of drastic government economy and other recovery measures. Altogether, by the fall of 1934 Roosevelt’s program was bringing a limited degree of recovery. The Reconstruction Finance Corporation, created on January 22, 1932, was the Hoover Administration’s most ambitious effort to deal with the Great Depression. It was the first use of government credit to aid troubled private companies-lending money to banks and businesses, hoping that prosperity will trickle down through the economy. But the 1.5 billion the Corporation lends-the greatest peacetime outlay by the federal government to that date-is not enough to reverse the economic collapse of the nation’s banking and financial systems. The Federal Deposit Insurance Corporation was created under the authority of the Federal Reserve Act of 1933, with the duty to insure bank deposits in eligible banks against loss in the event of a bank failure and to regulate certain banking practices. It was established after the disastrous collapse of the banking system in early 1933 and after state plans to insure depositors in the past had not proved successful.